Social workers who support some of Plymouth’s most vulnerable adults welcomed England’s top adult social worker to tell her about the inspiring work they are doing. Lyn Romeo, Chief Social Worker for Adults at the Department of Health and Social Care, visited adult social workers at Livewell Southwest to see first-hand the difference they are making to the lives of residents across the city. During her visit, Lyn heard how the different teams are leading the way to support those with mental health issues, and what is being done to help vulnerable people in the LGBGTQ community. Mel Wilson and Gareth Benjamin provide social care for adults with mental health issues. They are working to increase awareness of mental health problems in vulnerable people and give social workers the skills they need to support them, working with nursing and therapy colleagues. Lawrence Badman, Practice Educator, spoke about the gap in social work knowledge in working with gender identity across the organisation. He said: “In Plymouth there is a hidden history of those in the LGBGT+ community. “It means we are not best placed to support them and we find that we are having to ask people we work with to educate us rather than approaching the situation from a firm, confident knowledge base. Lyn also took part in a debate on integration and heard how having social workers based in teams across Livewell – including the Community Crisis Response Team – are enabling a better care approach. She also met with Craig McArdle, the Interim Strategic Director for People at Plymouth City Council. The visit concluded with a trip to Derriford Hospital to meet the hospital discharge team who assess the support people need to enable them to leave hospital when it is safe and right. 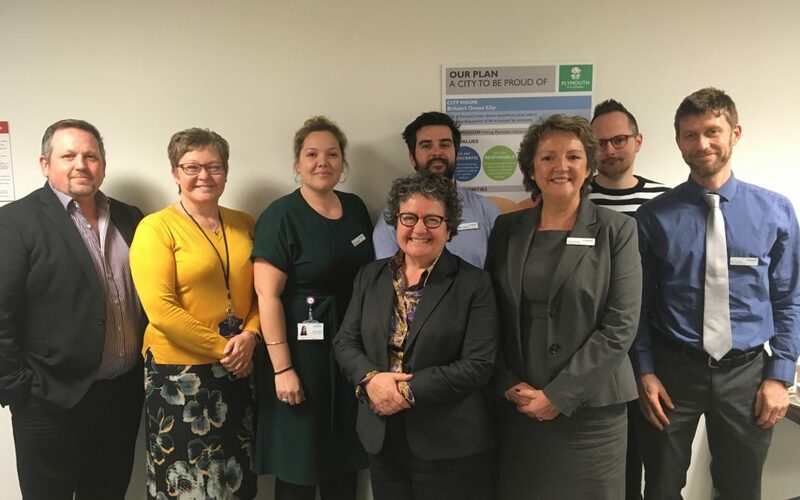 Led by Livewell’s Cheri Pearson, who was recently named one of the UK’s top social adult social workers, the team is made up of nurses, community care workers and social workers from University Hospitals Plymouth, Plymouth City Council and Livewell. Lyn said: “I’ve had a wonderful visit to Livewell and it has been fantastic so see the journey the team have taken to give a true, integrated approach to people coming to fruition and the value social workers in multidisciplinary approaches. Lyn’s visit to Plymouth followed on from a seminar hosted by Devon County Council for adult and children social workers across the county on Tuesday which coincided with World Social Worker Day. Kerry Dodd, Livewell Southwest Principal Social Worker, said: “It was a pleasure to welcome Lyn to Livewell and to show her some of the fantastic work our teams are doing to support vulnerable people in Plymouth and to hear about our future plans to ensure we continue to do this. “I am very proud of our workforce and their continued commitment to supporting social work practice.